Stamped leather case. Red burnt velvet lining. 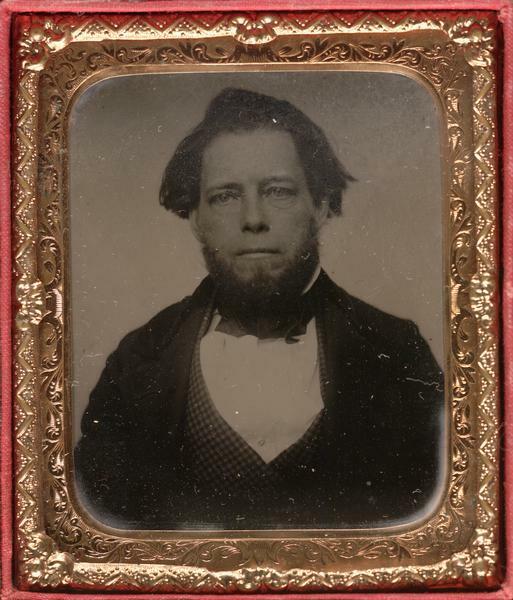 Lyman Draper spent years traveling through an area ranging from New York to Mississippi, gathering the stories of old pioneers and documentary material on frontier history for a projected series of biographies of Western heroes. His extensive collection was deposited with the Wisconsin Historical Society at Madison, of which he was secretary and librarian (1854-1886). His collection, valuable to many researchers, contains the George Rogers Clark papers and other manuscript sources. Double elliptical stamped mat. Burnt faded red velvet decoration inside cover. Stamped leather case.